Joe Johns was named CNN senior Washington correspondent in January 2014, previously he served as the networks senior correspondent covering the Supreme Court and criminal justice. Known nationally for his crime and law enforcement reporting, Johns previously served as senior correspondent covering current and political events across the networks programming. He has also contributed to the networks Americas Choice 2012 election coverage. Johns joined CNN as a congressional correspondent in January 2004. He is based in the networks Washington, D.C. bureau. Prior to CNN, Johns covered events on Capitol Hill for more than 10 years with NBC News. At the Capitol, Johns covered numerous debates about legislation, the impeachment of former President Bill Clinton, the anthrax mailings following the Sept. 11 terrorist attacks and the U.S. Supreme Court, including the death of Chief Justice Warren Rehnquist and retirement of Justice Sandra Day OConnor. He also broke the story of House Majority Leader Tom DeLays first indictment on conspiracy charges. Johns provided in-depth reporting on the Sago Mine disaster in January 2006. He covered the entire Beltway Sniper saga from the first shootings to the arrests of two suspects and was among the NBC Nightly News team to receive an Edward R. Murrow Award from the Radio-Television News Directors Association for the reports. Johns reporting has also included the White House and the Pentagon. In 1996, he covered Bill Clinton's historic tour of Africa and followed first lady Hillary Clinton on a seven-nation visit to central Europe. In 1994, he traveled to Haiti with Marines ordered by Clinton to assist in that country's transition from a dictatorship to a democracy. Johns first came to Washington, D.C., in 1983 when he joined WRC-TV, an NBC affiliate. There, he won an Emmy for a spot news piece on the violent tactics of the Nation of Islam to rid a district neighborhood of drugs. Before joining WRC-TV, Johns was a reporter at WSOC-TV, Charlotte, N.C. He began his TV career as a reporter and anchor in 1980 at WSAZ-TV in Huntington, W.Va. Most recently, Johns reporting contributed to two 2011 Emmy Awards for Anderson Cooper 360°s Haiti earthquake coverage. 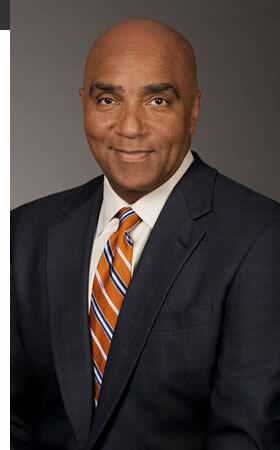 Johns is the recipient of two National Association of Black Journalists Salute to Excellence awards. He was honored first in 2005 for a profile on lynching survivor James Cameron and then again in 2007 for a series of pieces on environmental injustice. He contributed to CNNs Emmy award-winning Election Night coverage in 2006 and he was a member of the Peabody Award-winning Best Political Team on Television throughout the networks 2008 America Votes election coverage. Johns is a former chairman of the executive committee of Correspondents of the Congressional Radio and Television Galleries and president of the Radio and Television Correspondents' Association. He is also a member of the board of the National Academy of Television Arts and Sciences for the National Capital Chesapeake Bay Chapter. He earned a bachelor of arts degree in political science from Marshall University in Huntington and a law degree from American University.